My first, second, and third attempts at cooking sisig didn't hit my list of favorite dishes by a long shot; in all honesty, my attempts often turned out too chewy, dry, or merely okay. I'm eager to get this dish down in the hopes to feed my family well, bring back great memories of the Philippines, and test my recipe development skills. So, here it goes. My fourth attempt at pork sisig! This quote was probably tied to an event that was serious in nature. Luckily, I'm really serious about my sisig and tried different techniques to make it all come together. Step one? Perform more in-depth research compared to my previous attempts. Here, I bookmarked and noted several sisig recipes in the hopes to find the standard foundation of what makes sisig, sisig. Then, I made a separate list of all the "add-ons" cooks used to make their dishes tastier. I chose the ingredients I liked from my "add-on" list according to my taste. Step two: I took my frankensteined ingredient list and started adding measurements influenced by what I typically saw across other recipes. Step three: With my newly developed recipe sitting on my kitchen counter, I went to cooking! I used measuring cups and spoons to add ingredients and made sure I started off with small portions so I can build flavor as I continued to cook. Tasting along the way and making sure to adjust your written recipe is key! What I started to learn while researching Filipino food is that there are a lot of recipes with no exact measurements or steps involved. I think this is what makes it difficult for new Filipino American cooks, like me, to replicate food from our heritage. I think Gilda Cordero Fernando, a well-known writer and publisher in the Philippines, writes about this topic in her poem "Halo-Halo" very well. What is the history behind recipe development in the Philippines and, often times, why aren’t there measurements and steps involved? Oral History. I’m not sure if I need to say anything more on this topic other than recipes were passed down from family member to family member. Though, I think I can say that only stories, songs, riddles, and poems were written in baybayin (indigenous script) during pre-colonial times. Filipinos are damn good cooks. Someone who cooks with their judgment juggles his/her knowledge of basic cooking methods, ingredient characteristics, ingredient functions, and their cooking times. I can’t tell you enough how many times I’ve seen my family members eyeball measurements and improvise a recipe. And although I’m not going to write an entire list of ingredient functions and characteristics, I do think it’s cool to note that the Philippines heavily relied on Austronesian cooking methods before colonial times—boiling, steaming, and roasting. Languages in the Philippines changed over time. I read that there were hundreds of languages and dialects in the pre-colonial Philippines. This makes total sense because of the archipelago’s geography, right? But, what if you mixed those dialects up by teaching Spanish during the Spanish colonial rule and English during the American occupation? Talk about confusion. And yes, it still bothers me that we don’t know the native Filipino word for adobo. After three centuries of Spanish rule, America occupied the Philippines from 1898 - 1946. During this time, the U.S. government sent around 600 Thomasites (American teachers named after the U.S.S. Thomas) to promote the English language and establish an education system. Later, I learned that school expansion rapidly grew in the late 1930s and similarly, the literacy rate in both Filipino (Tagalog-based) and English grew as well. However, education levels still varied across the islands due to factors like accessibility, affordability, and so on. This means, reading, writing, and measuring out recipes were most likely done by those of a wealthier social class. When the meats in the pot are almost done tenderizing, add your medium diced onions to a grill pan and cook until translucent (3-5 minutes). Add your chopped chicken livers to the grill pan and cook on a medium heat. Remove your tenderized meat from your pot and chop into small, fine pieces. Add these pieces to the grill pan and cook until crispy edges start to form. Keep cooking until you have your desired amount of crispiness to your dish. Once your meat is to a texture of your liking, mix in your minced ginger and garlic. Cook for 2-3 minutes then add your liquids. Reduce liquids to concentrate flavor until liquids don't gather at the bottom of your pan. Season with salt and pepper to taste. 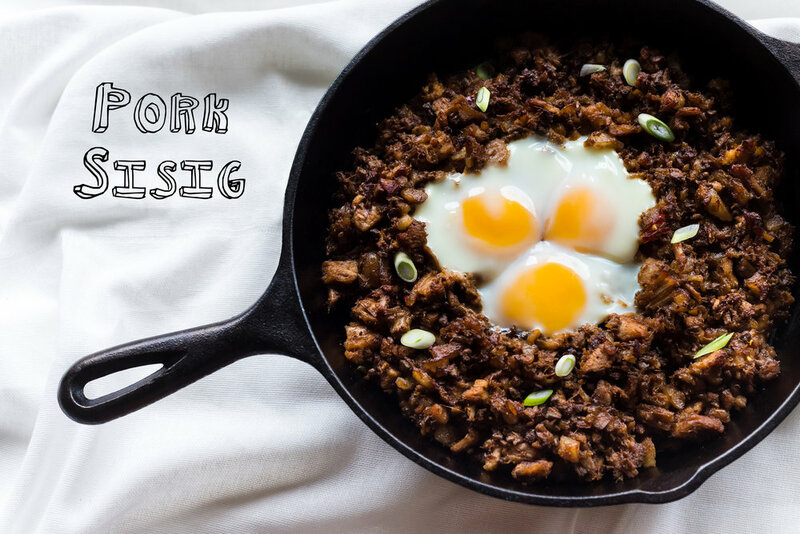 Transfer your sisig to a hot cast iron skillet that's had a pat of butter melted on the bottom. Make a well in the middle of your sisig dish and crack three eggs into it. Finish on the stove with a lid to cook eggs through or broil in the oven. Pig snout. Seems weird but totally good. Tenderizing pot ingredients without the water. An unintentional chicken liver heart. This is my situation when I'm not trying to get attacked by flying pork pieces.